Lake Restoration has been making lake weeds disappear for over 40 years! 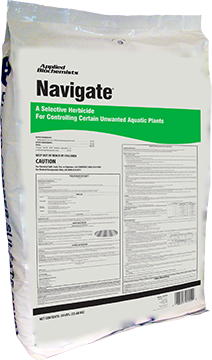 Kill lake weeds when you use Navigate® Herbicide or Liquid 2,4-D! Both are aquatic herbicides excellent for Eurasion watermilfol control, and are also an effective Water Lily and Watershield killer. Same active ingredient as Aqua Pellets. Free shipping! For a more complete solution, we recommend using additional dock and swim area products to provide your water relief from weeds and algae. Spray or spread evenly throughout treatment area when weeds are present. When applying the liquid 2,4-D herbicide, we recommend using the TORMADA® product application boat. Selective Herbicide is formulated to control water milfoil, water stargrass, bladderwort, white and yellow water lily, water shield, water chestnut, and coontail. Water use is restricted for non-turf irrigation and drinking (human consumption), see label for details. Liquid 2,4-D Manufactured by Alligare, LLC. Navigate® Granular 2,4-D Manufactured by Arch Chemicals, Inc.